Once the memorial service is organized, you will be able to design a service program. A service program is a booklet celebrating the honoree and given to people attending the funeral service. It is a cherished keepsake. Using a computer desktop publishing program, you can produce an inexpensive yet elegant program. Most programs are based on standard paper sizes that can be folded, stapled or stitched. While service programs can be any size you choose, a typical program is printed on 8.5 X 11" paper and folded in half. If you have a friend or family member who is a graphic designer or is artistically talented, ask them to design the program for you. While paper programs are a traditional way to share the service information with the guests, you could also project the program on a large screen (if one is available) or have the program printed and mounted on a board if it is a small group. 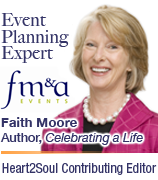 You can post the service program in your honoree's Heart2Soul Community.